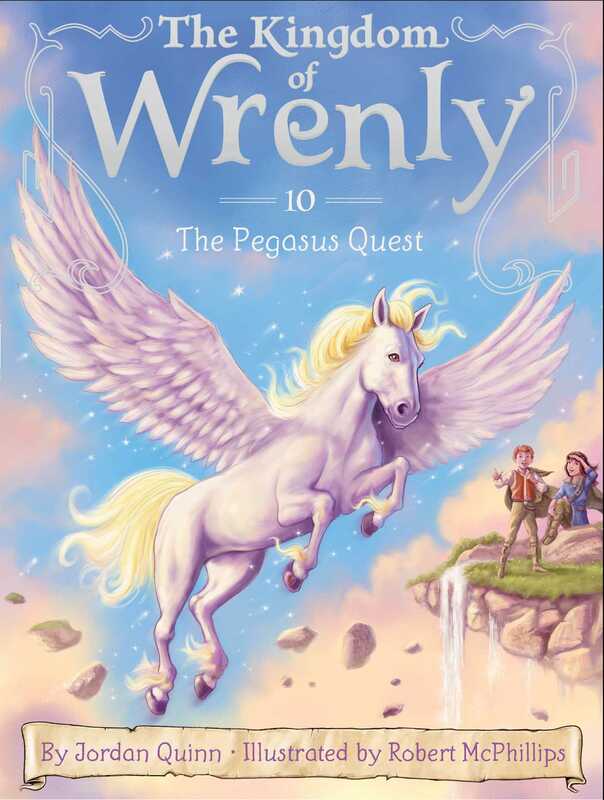 In the tenth fantastical adventure of The Kingdom of Wrenly series, Prince Lucas and Clara must rescue a young Pegasus. When a shooting star streaks across the night sky, Prince Lucas makes a wish for an epic adventure. Little did he know it would come true! As Lucas and Clara set out to investigate some mysterious happenings in Wrenly, they find a Pegasus that is lost and in danger. Will the two friends be able to help the mystical creature find its way back home to a floating castle high above in the clouds? Prince Lucas and his best friend, Clara Gills, leaned on the balcony railing and gazed at the full moon. A ribbon of blue light shimmered across the Sea of Wrenly. But this was no ordinary moon. It was a blue moon—something so rare it is said to happen only once in a lifetime. All the owls in the kingdom flocked together and sang once in a blue moon. Lucas and Clara waited and listened for the owl song. Ruskin yawned, stretched, and curled up near the children. The young scarlet dragon had no interest in singing owls. He shut his eyes and sighed peacefully. “Look at that enormous blue cloud,” said Clara, pointing. Lucas tilted his head back. “It’s been there since this afternoon,” he said. Lucas looked at the great cloud thoughtfully. “Maybe there’s a floating castle inside it,” he said. Clara laughed. “You read too many fairy tales!” she said jokingly. “And most of them have turned out to be true,” Lucas reminded her. Then they began to hear a steady thrum. It sounded like the deep beating of wings. The friends turned toward the blue moon and gasped in wonder. Hundreds of owls swirled across the moonlight. The children stood very still and listened. The owl song began softly, and gradually got louder. Hoo Ha HOO-hoo-hoo! Hoo Ha HOO-hoo-hoo! Goose bumps tingled and swept over the children. “Like a ghostly chorus,” agreed Clara. The owls sang and soared gracefully, round and round in the blue-glowing night sky. “Wow, I wish I could fly like an owl,” Lucas said, spreading his arms out. The owls finished their eerie song and disappeared into the night. Then a dazzling shooting star blazed across the sky. “Make a wish!” Lucas exclaimed. The star left a sparkling trail of light as it vanished over Burth, the island of the trolls. “What did you wish for?” asked Clara. “I wished for an adventure,” Lucas said.